I’m still struggling with openFOAM. 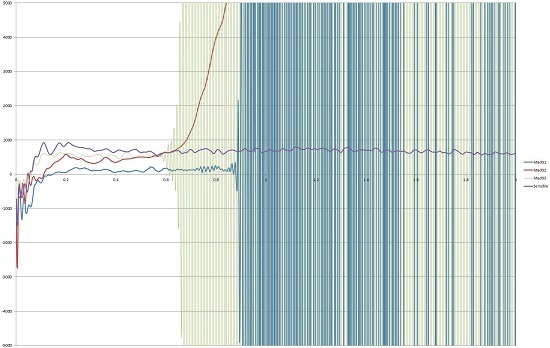 Then there’s what happens when things go wrong, as shown below, the graphs here are from 4 seperate runs showing X forces for the first 1000 iterations. 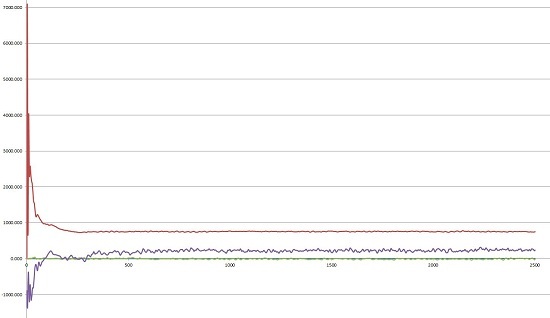 The purple line is the sensible data, the green and blue lines show a phenomena where the results instead of converging yo yo exponentially out of control. The red line shows a different situation where a value will just keep climbing. Looking at these numbers its not hard to spot something has gone horribly wrong, whats harder to work out is what it was and how to stop it from happening. At the moment I think most of these of issues are caused by mesh problems, so currently that’s the direction I’m looking. Hopefully I’ll find a way to stop this sort of thing from happening too often, which it is at the moment. PreviousJune 17, 2012. Body Design. OpenFOAM CFD.